The Guest Access feature allows you to create a separate network for your guests without allowing them to access your main network and the computers connected to it. This feature is automatically enabled and secured by the Linksys Connect software. However, you can also enable it manually using the router’s web-based setup page. Only the latest product models of Linksys Wi-Fi / Smart Wi-Fi Routers and Linksys X-series Gateways (X1000, X2000, X3000, X3500, and X6200) have the built-in Guest Access feature on their web-based setup page. Access the web-based setup page of your router or gateway. For instructions, click here. If you’re using a Mac® computer, click here. For instructions on how to access the setup page through the Linksys Connect software, click here. Click the Wireless tab, then the Guest Access sub-tab. NOTE: This tab may not be available for certain models. You may also set up the wireless network for guests with Internet access only using the Linksys Connect software. For instructions, click here. Select yes in the Allow Guest Access section. It will then show the default password generated during the initial setup of the router. NOTE: Click on the Change button if you wish to personalize the password. NOTE: The Guest Network Name will always follow the main network’s SSID followed by a “-guest” suffix. If you want to modify your Guest Network Name, you have to change your home wireless network name first. The maximum number of guests can be changed by clicking on the dropdown beside Total Guests Allowed. With the Linksys Smart Wi-Fi Routers, the number of allowed guest access users has increased from 10 up to 50 users when configured on the router's web-based setup page. Enter your preferred password, then click Change. Once done, click Save Settings. Your guest network is now set up using the password that you have created. This will be the password that your guests will enter once they are prompted upon launching a web browser (i.e Internet Explorer®). They may now connect to the guest network automatically. 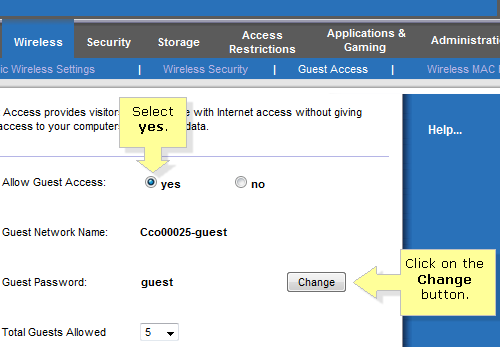 If you want to set up your Guest Access using Linksys Smart Wi-Fi, click here.